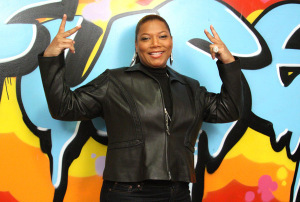 Happy Birthday to Queen Latifah! The beautiful Queen celebrated her 39th birthday over the weekend in Los Angeles. Queen Latifah's birthday was on March 18th. Some of the celebs at the party were Paris Hilton, Tyrese,LisaRaye, Kim Kardashian, Lil Kim, Vivica Fox, Nas, Omar Epps, Evan Ross and Latifah's rumored "girlfriend" fitness trainer Jeanette Jenkins. Click here for more pics. It's a shame about Lil' "Black Barbie" Kim who lightened her skin and altered her features to look like someone else. Kim was a pretty dark skinned brown girl back in the day. SMH. Queen Latifah was making the rounds promoting her new movie 'Mad Money.' 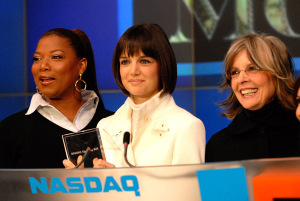 She started off the day on Wall Street with 'Mad Money' co-stars Katie Holmes and Diane Keaton. She also stopped by Fuse TV. Katie Holmes joined Queen Latifah on the couch at BET 106 & Park with Terrence and Rocsi. Fact: Katie Holmes is a fan of hip hop music. She kept listening to Kanye West's song 'Stronger' on her ipod while running the New York Marathon.